The Château offers luxurious accommodation, boasting 8 bedrooms all furnished to a high standard (scroll below for bed configurations). The modern kitchen is well equipped with a large American Fridge Freezer, microwave, SMEG oven, dishwasher and integrated coffee machine. The formal dining room can seat up to 20 plus two high chairs, or there is a smaller casual breakfast table in the kitchen. The entire Château is equipped with strong WiFi, a small office with a printer, as well as books, toys, games and plenty of baby equipment. The entire Château may be hired for vacation rental, and guests may request to host a wedding on the grounds during their stay. Single-room or partial hire is not possible. 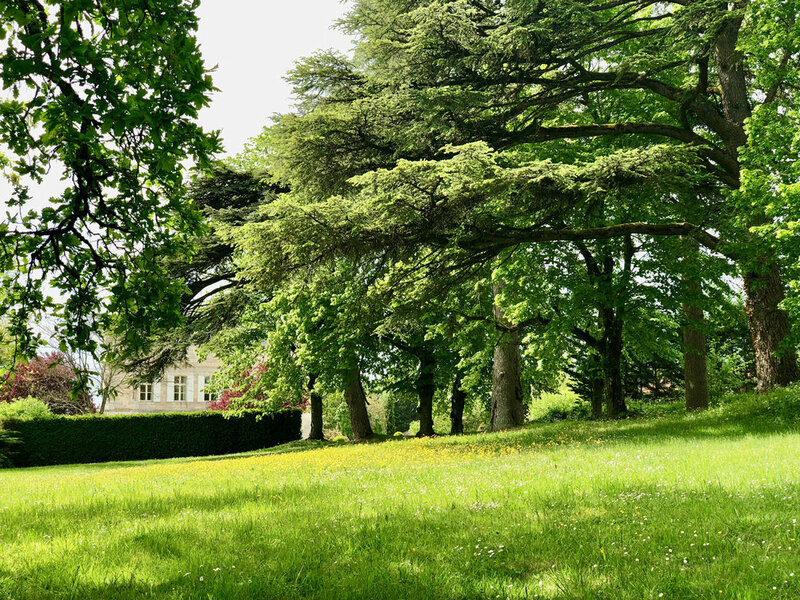 The colours of the gardens are ever-changing with the seasons, and offer the formality of cut lawns and sunny terraces, as well as meadows, orchards and a private lake to enjoy. Outdoor dining on the terrace overlooking the lake is great for BBQs and a perfect way to enjoy the sunset. Look out for the family of little ducks and a family of shy beavers who have settled lakeside! The large 12m x 6m heated pool is a sun trap in the warmer months, and two tented gazebos are provided for some needed shade. Below the Games Room is the Orangerie, ideal as an events space for wedding and large parties. See our Weddings page for photos. "Versaille" sleeps 2, a kingsize 4 poster bed with an en-suite bathroom set in the tower, French windows overlooking garden. "Lille" sleeps 3, a kingsize + a single, with its own en-suite bathroom set in the tower. French windows overlooking the swimming pool, terrace and gardens. "Aix-en-Provence" sleeps 2, a kingsize with en-suite bathroom, French window overlooking the lake. "Chartres" sleeps 3, ideal for youngsters with two single beds plus a pull-out trundle bed. The en-suite has a shower, basin and WC. Garden View. "Arcachon" sleeps 2, is a large double room with en-suite shower-room set in the tower. Same view as Versaille. "Saint-Etienne" sleeps 3, is a large double room plus a single with en-suite shower-room set in the tower. Same view as Lille. "Cannes" sleeps 2, is a double room with access to the family bathroom and WC. Same view as Aix-en-Provence. "Le Mans" sleeps 5, with two set of bunk beds and a toddler bed (1.3m long), ideal as a kids room. Same view as Chartres. The maximum total number of guests allowed in the entire château is 15. 2 cots for babies and a changing table are also available. Single beds are mostly flexible and may be moved upon approval, but must be returned to its original location at departure. These configurations are subject to change at the Château's discretion.